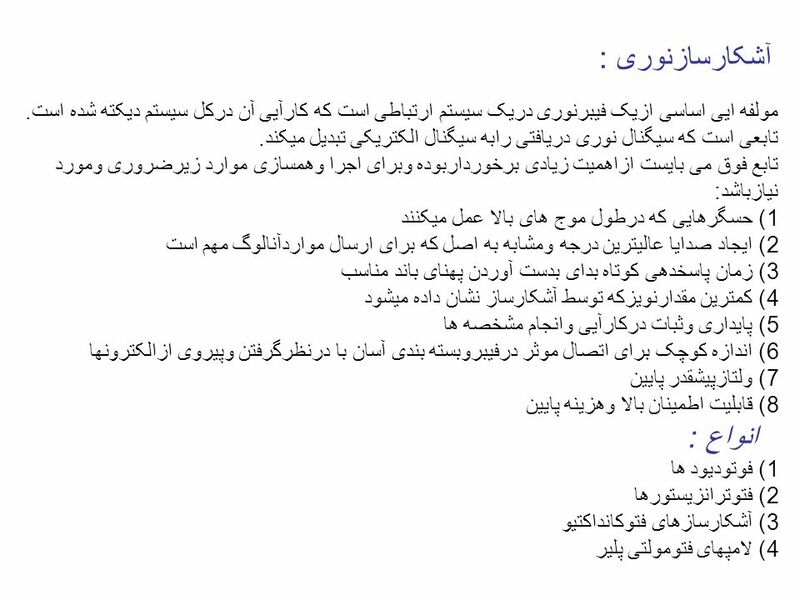 5 اصل آشکارسازی نوری : برخوردیک فوتون درناحیه تخلیه میتواند منجربه برانگیخته شدن یک الکترون ازباندظرفیت به باند هدایت ودرنتیجه ایجادحفره درباندظرفیت شود. 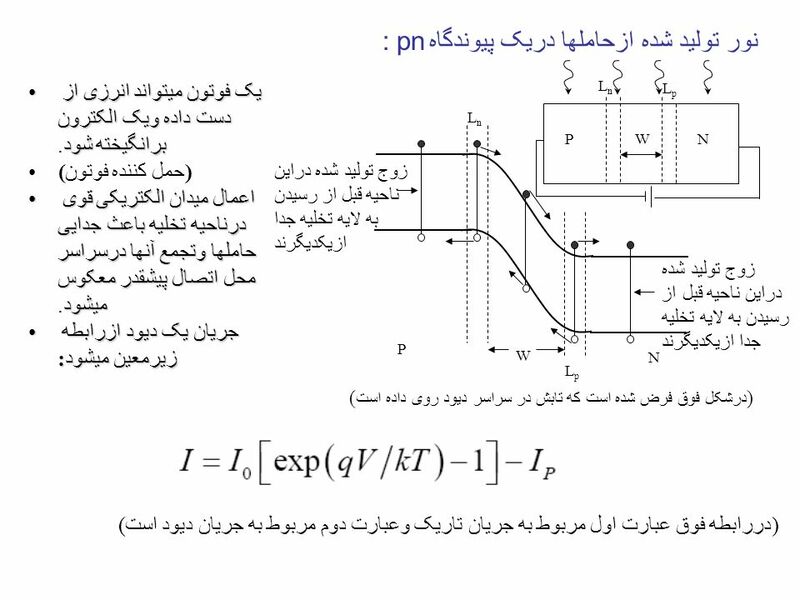 (تولیدفوتون) زوج حامل تولیدشده درنزدیکی پیوندگاه ازیکدیگرجداشده اند وتحت تاثیرمیدان الکتریکی که باعث ایجاد یک جابجایی توسط جریان درمدارخارجی (درفزونی هرجریان نشتی بازگشتی) میگردد جاروب میشود. 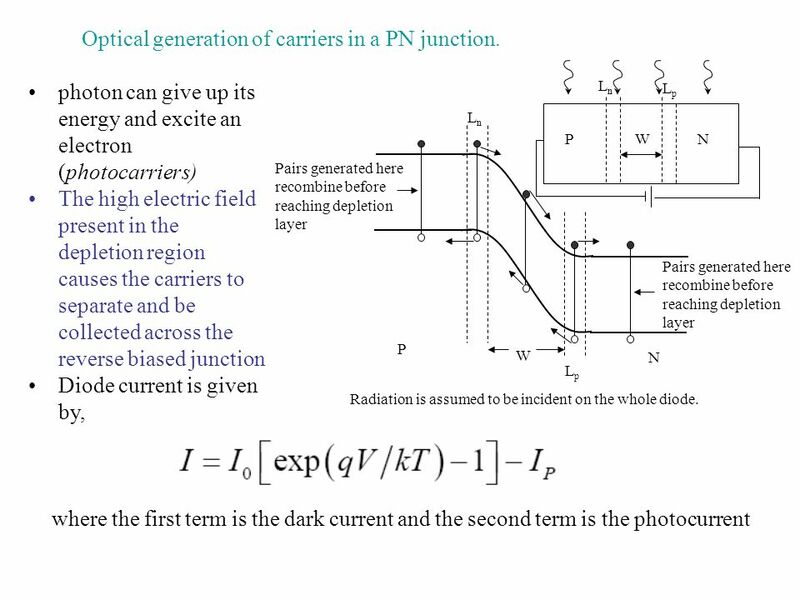 6 Optical generation of carriers in a PN junction. 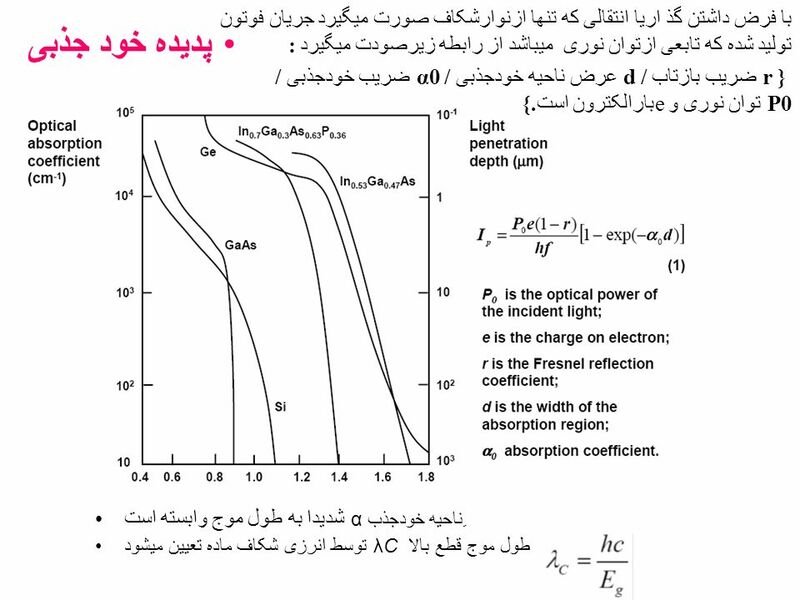 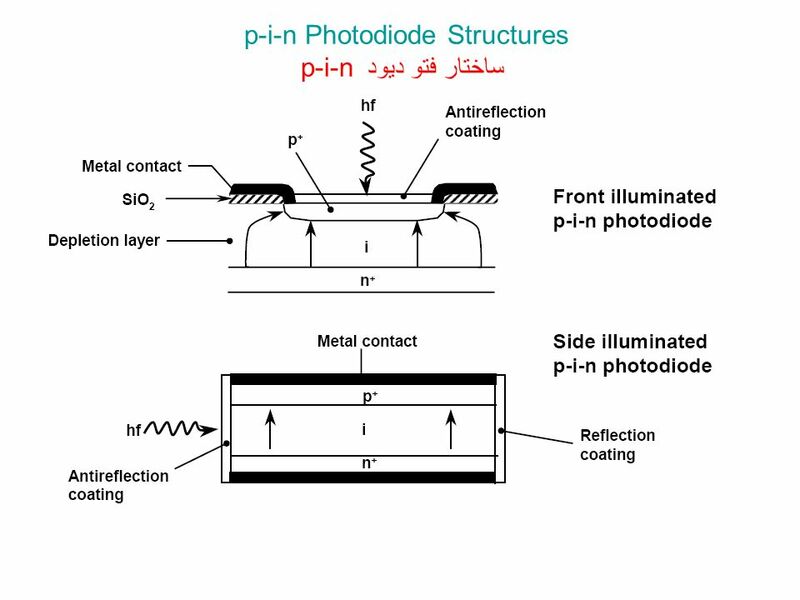 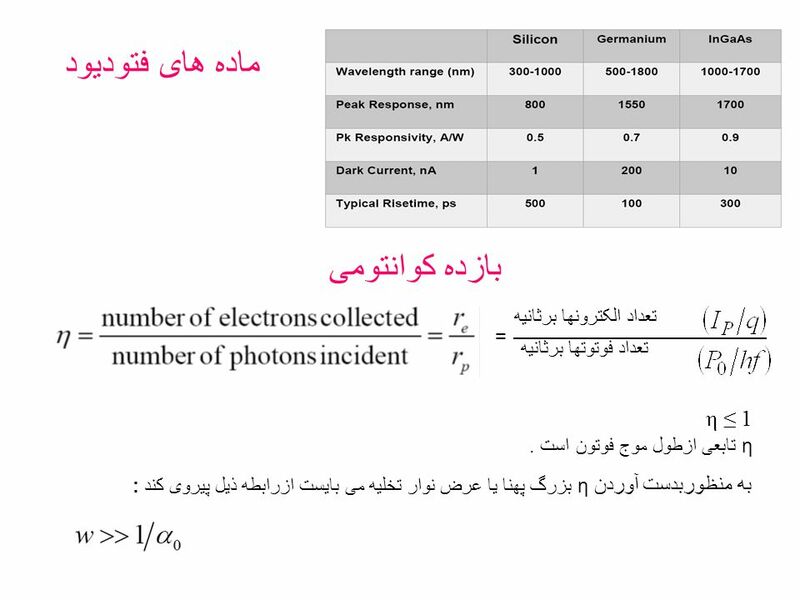 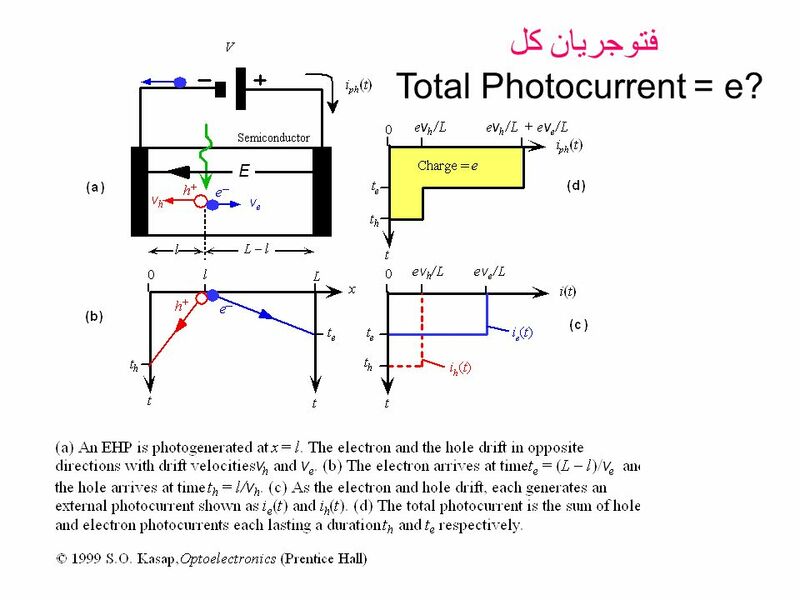 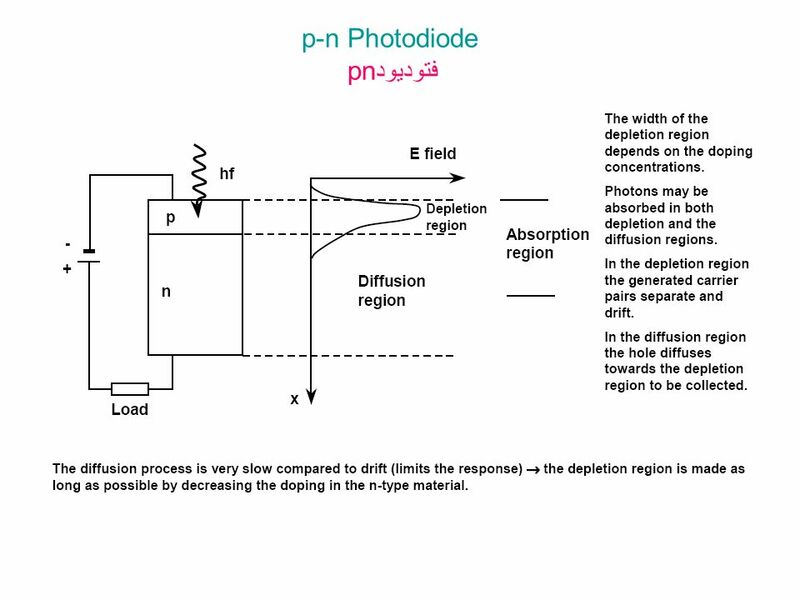 10 فتوجریان کل Total Photocurrent = e? 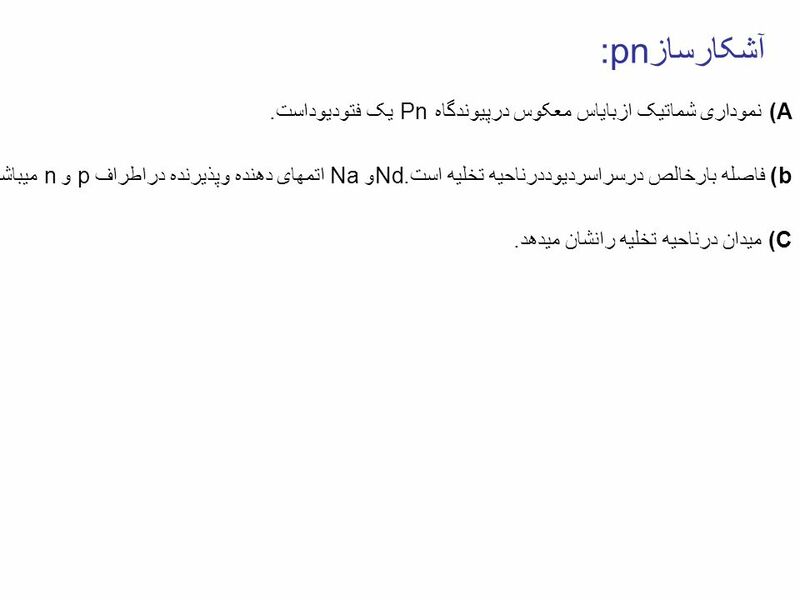 22 :pnفتودیود ١) فوتونها میتوانند درهردوناحیه تخلیه وپخش جذب شوند. 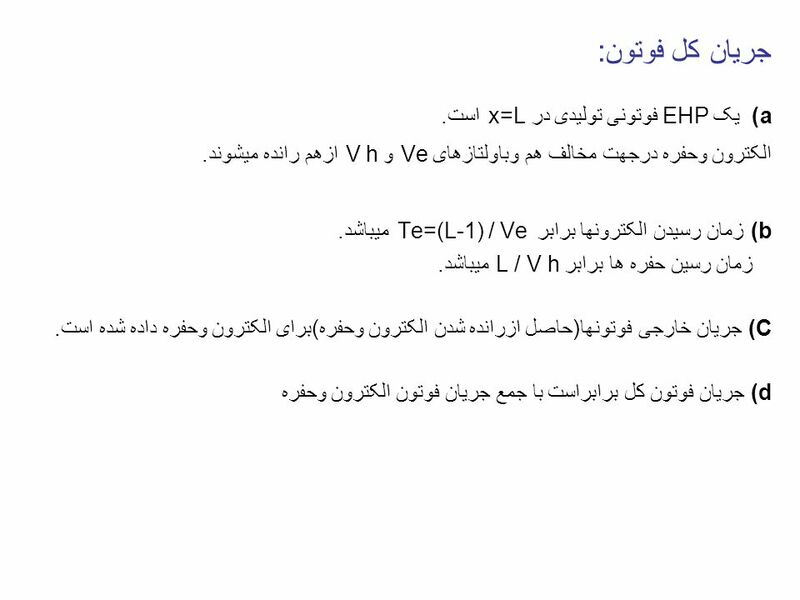 ۲) زوج حامل تولید شده درناحیه تخلیه به صورت جدا ازهم وشناورند. 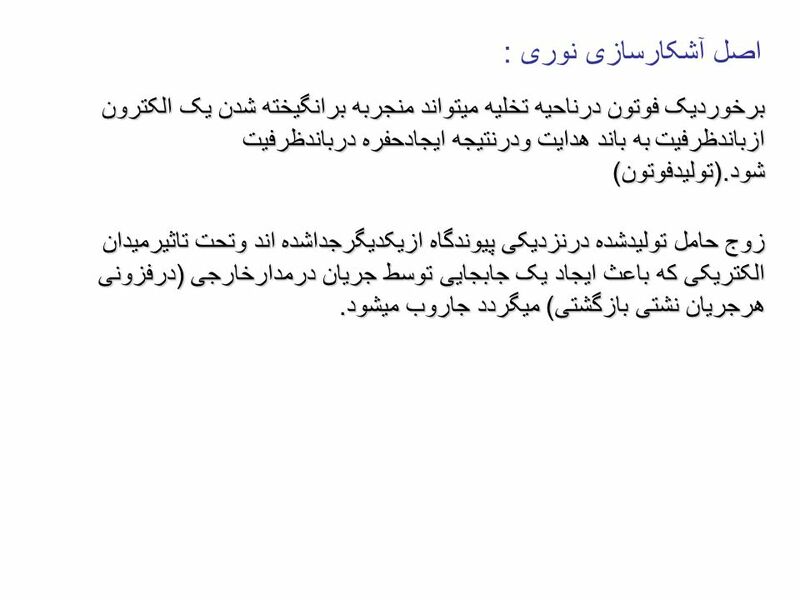 ۳) درناحیه پخش حفره به طرف ناحیه تخلیه دارای تجمع وپخش شدگی است. 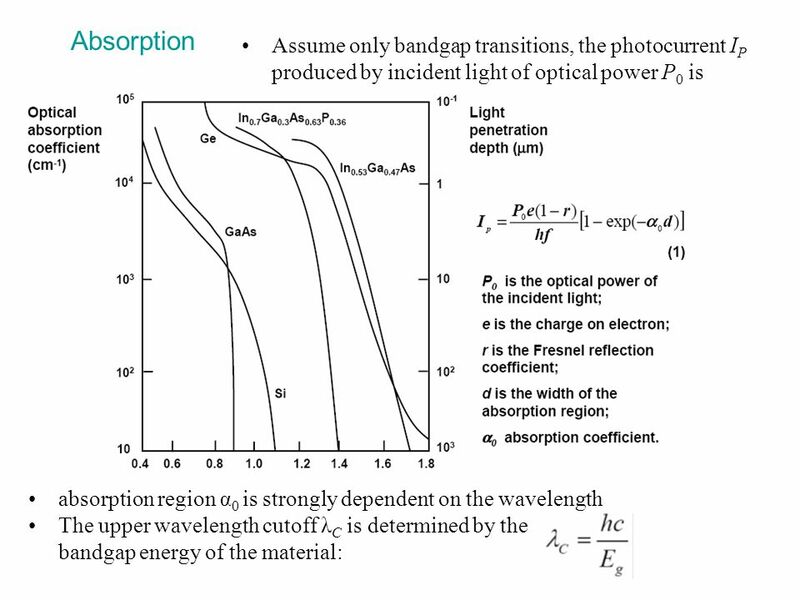 Epitaxial growth of several layers on a n type InP substrate. 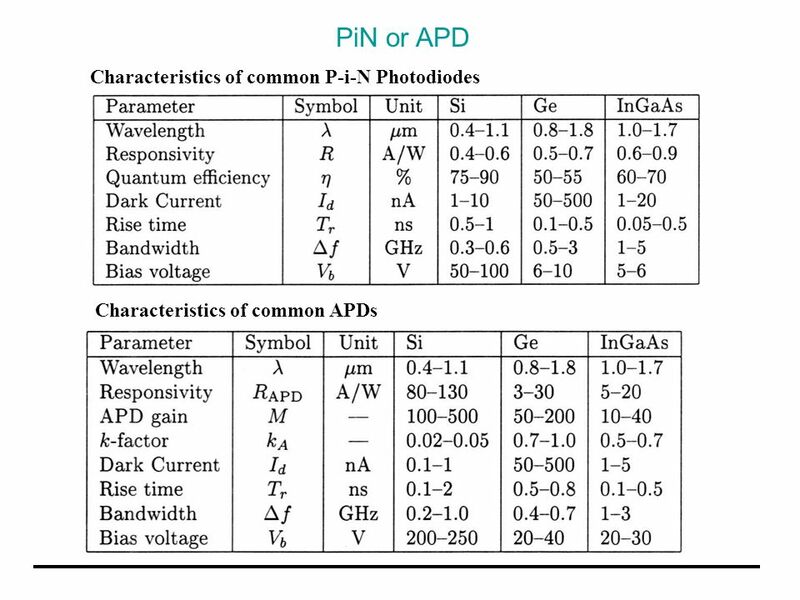 Incident light is absorbed in the low doped n type InGaAs layer lattice matched In0.53Ga0.47As/InP system, C = 1.67mm Drawback - optical absorption in the undepleted p+ region. 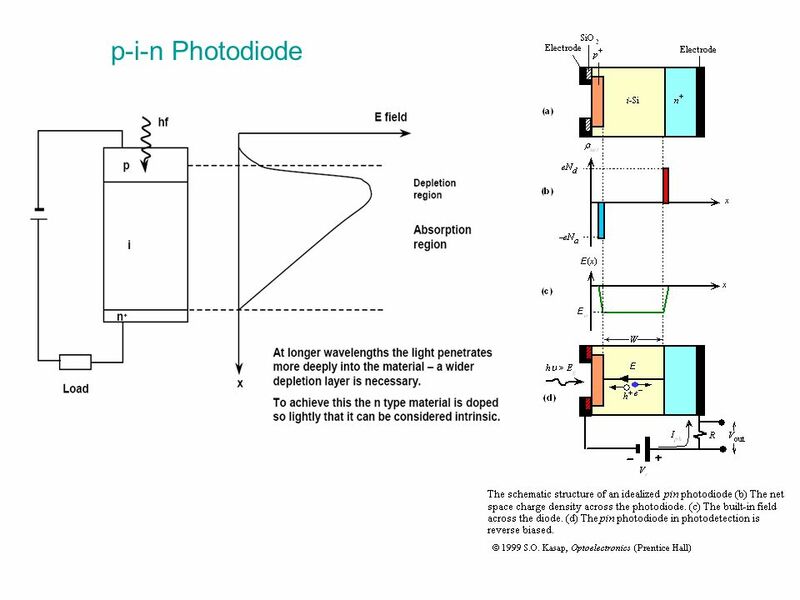 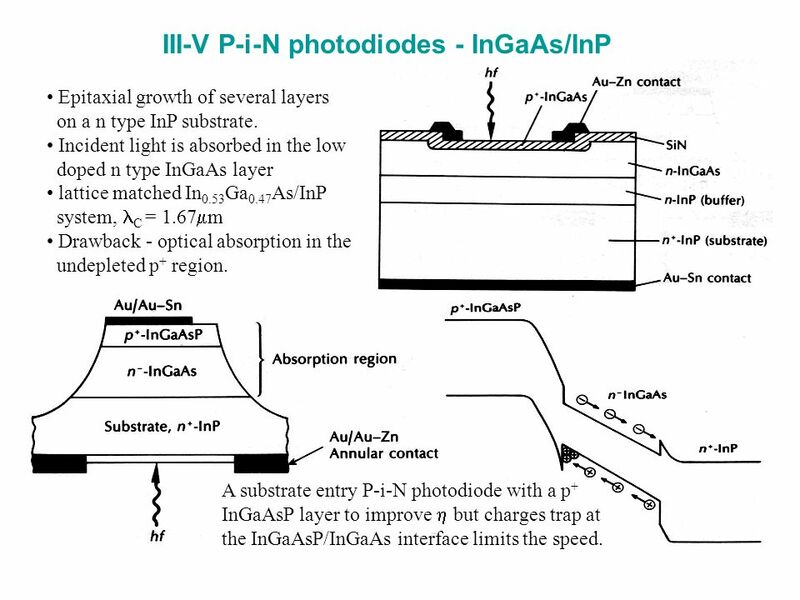 A substrate entry P-i-N photodiode with a p+ InGaAsP layer to improve  but charges trap at the InGaAsP/InGaAs interface limits the speed. 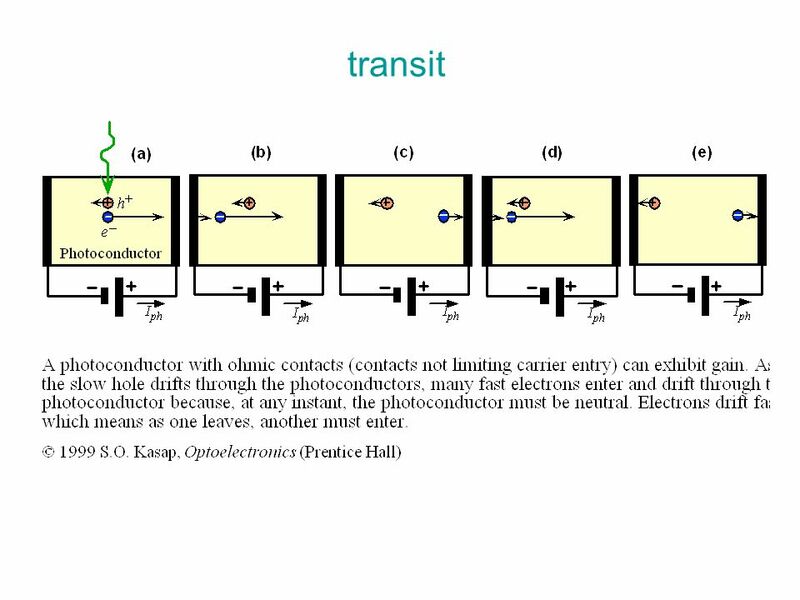 the transit time of carriers across the absorption region the time taken by the carriers to perform the avalanche multiplication process the RC time constant incurred by the junction capacitance of the diode and its load The bandwidth in the very low gain regime is usually limited by the diffusion tail due to incomplete depletion of the absorption layer and by hole trapping in heterostructure APD, due to insufficient electric field at the heterointerface. 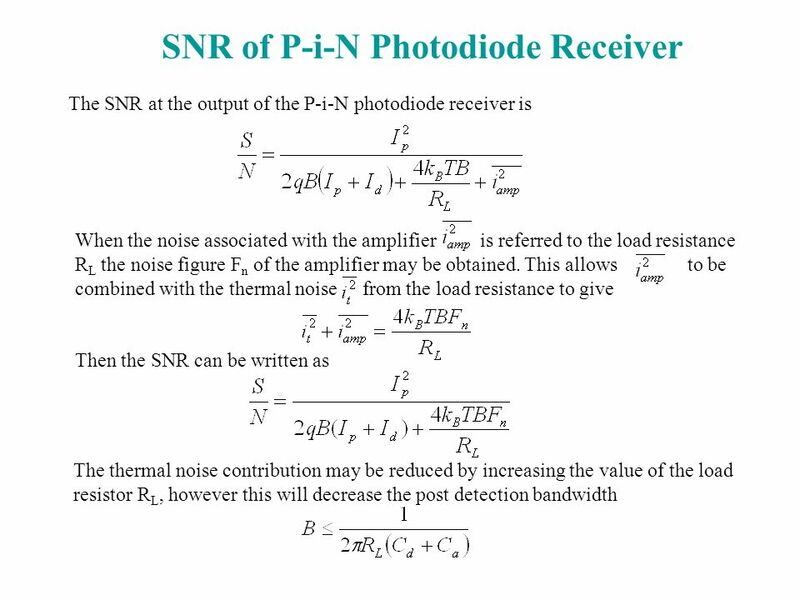 At moderate gains (5-20), the bandwidth is almost independent of gain. 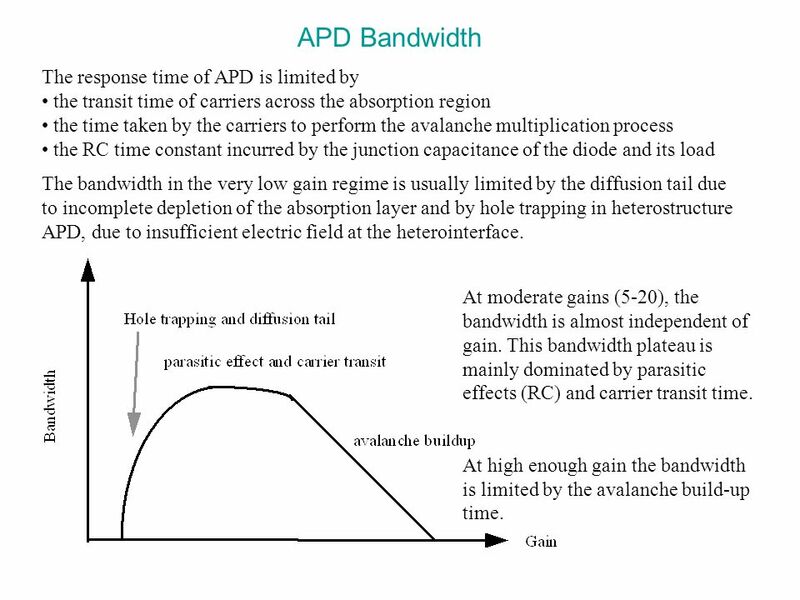 This bandwidth plateau is mainly dominated by parasitic effects (RC) and carrier transit time. 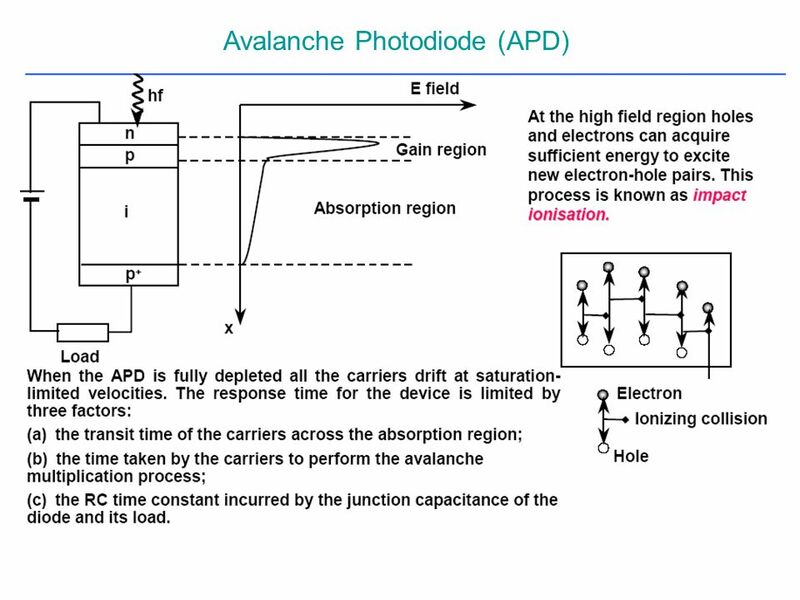 At high enough gain the bandwidth is limited by the avalanche build-up time. 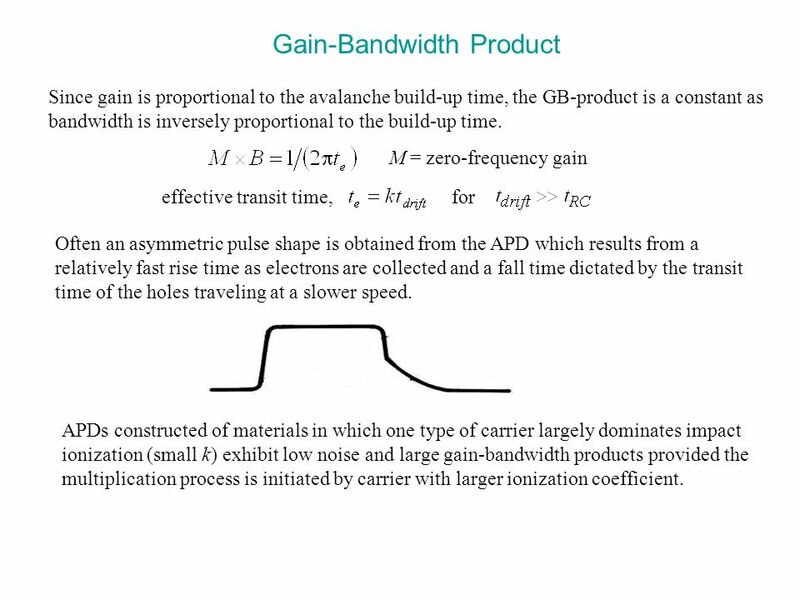 Since gain is proportional to the avalanche build-up time, the GB-product is a constant as bandwidth is inversely proportional to the build-up time. 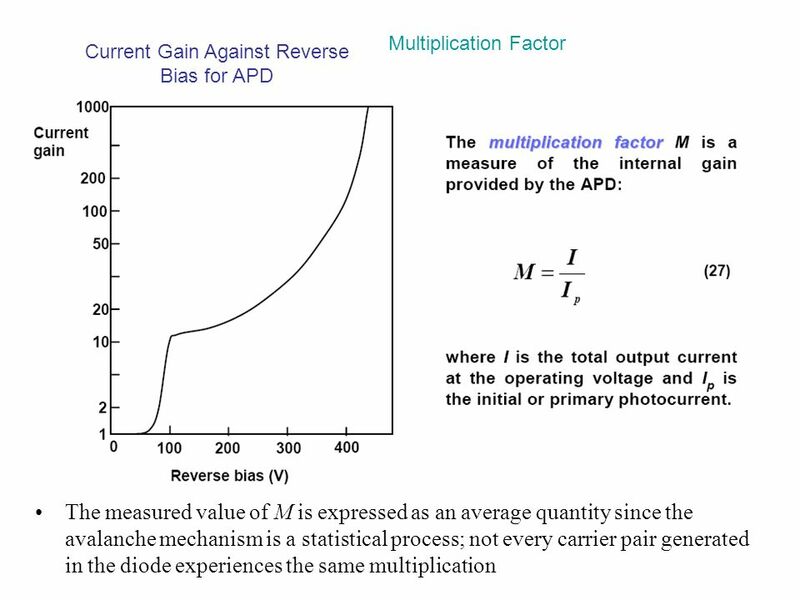 M = zero-frequency gain effective transit time, for Often an asymmetric pulse shape is obtained from the APD which results from a relatively fast rise time as electrons are collected and a fall time dictated by the transit time of the holes traveling at a slower speed. 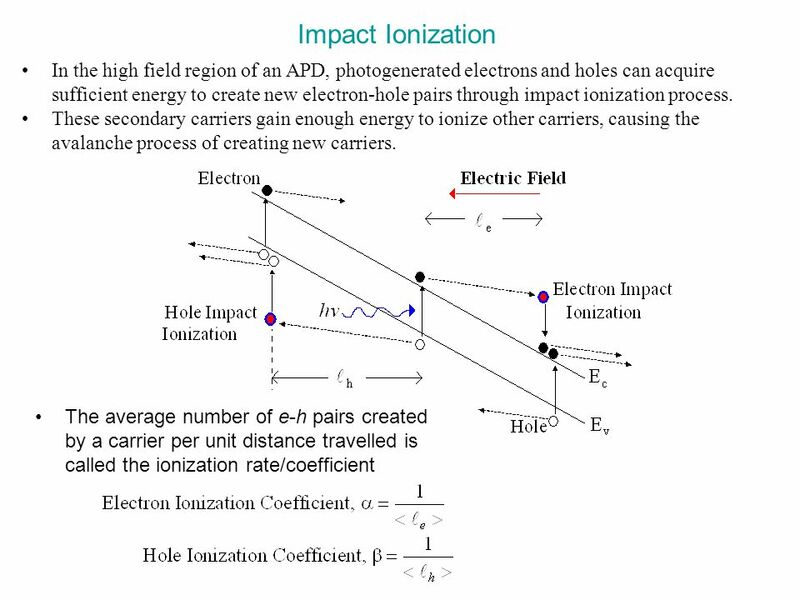 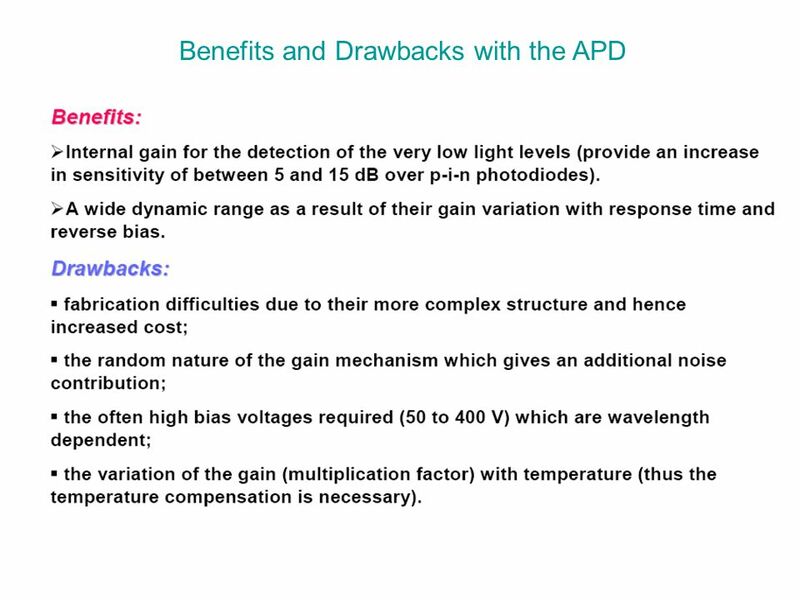 APDs constructed of materials in which one type of carrier largely dominates impact ionization (small k) exhibit low noise and large gain-bandwidth products provided the multiplication process is initiated by carrier with larger ionization coefficient. 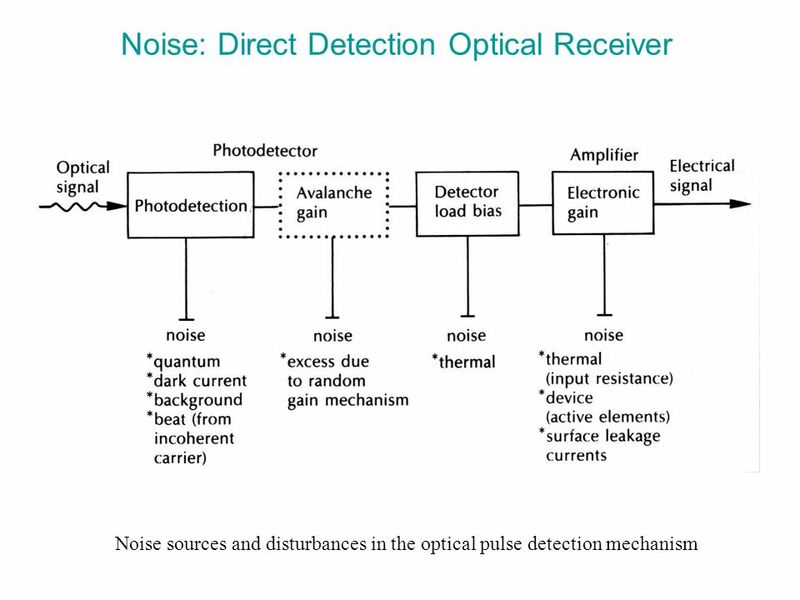 The power signal-to-noise ratio at the output of an optical receiver is defined by Signal power from photocurrent Photodetector noise power+amplifier noise power For both signal power and noise power are released at the same load resistance, average photocurrent root mean square value of the noise induced current Noise Equivalent Power (NEP) NEP is the minimum optical signal power that produces SNR = 1. 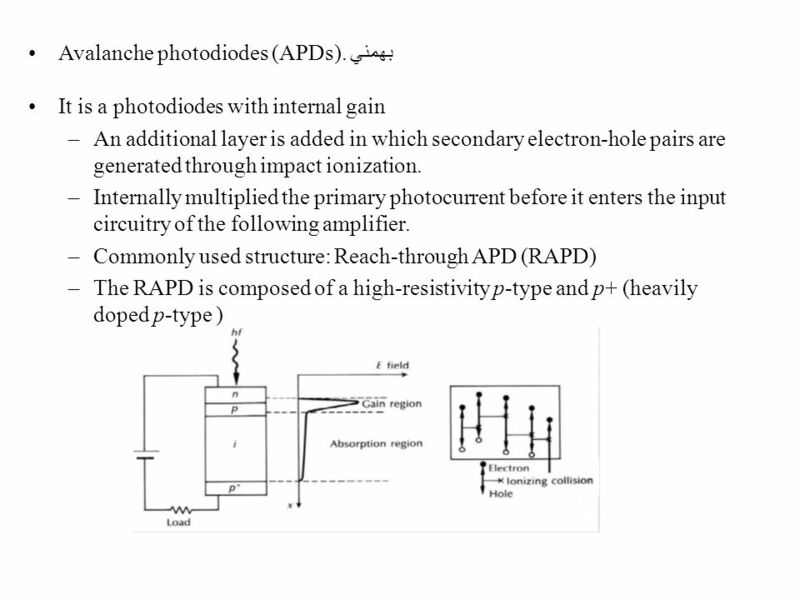 This is the optical power necessary to produce a photocurrent of the same magnitude as total noise current. 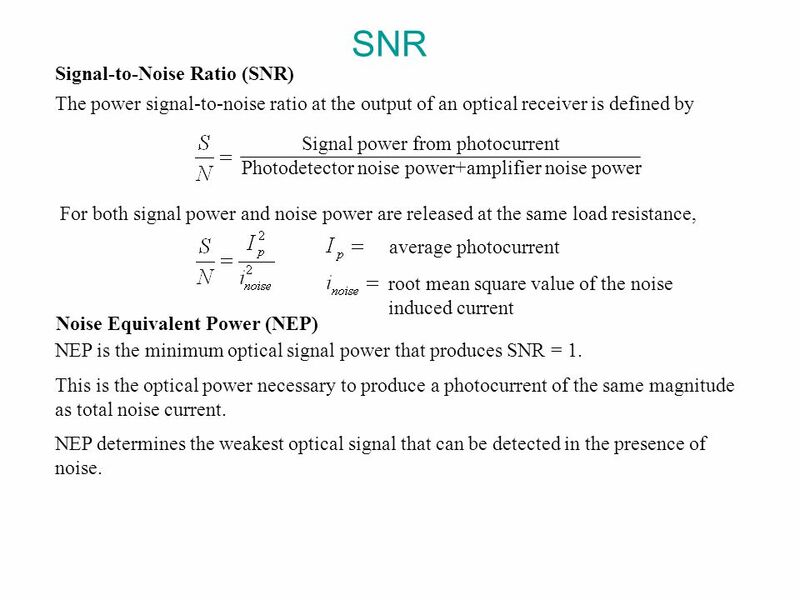 NEP determines the weakest optical signal that can be detected in the presence of noise. 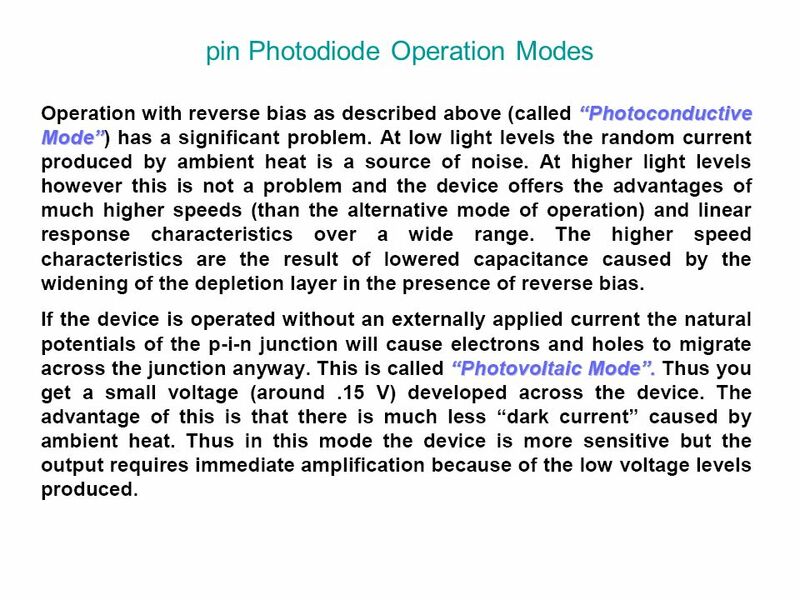 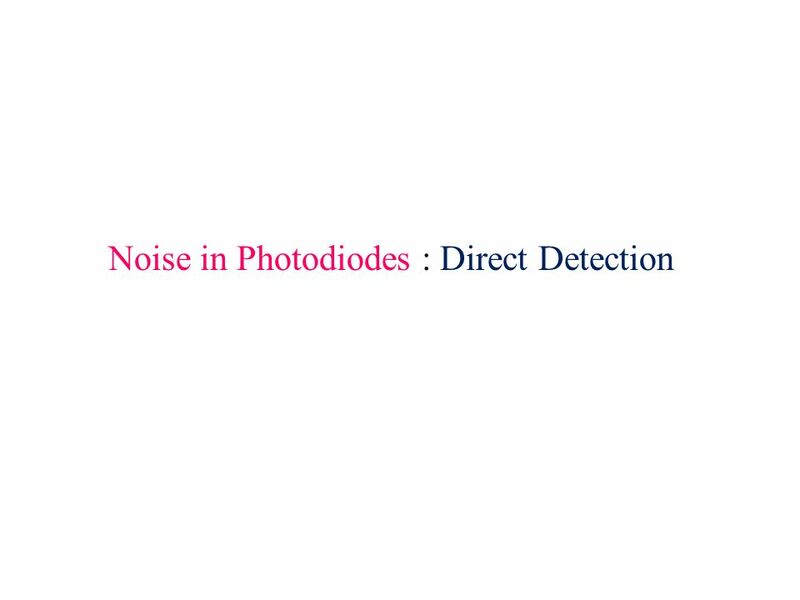 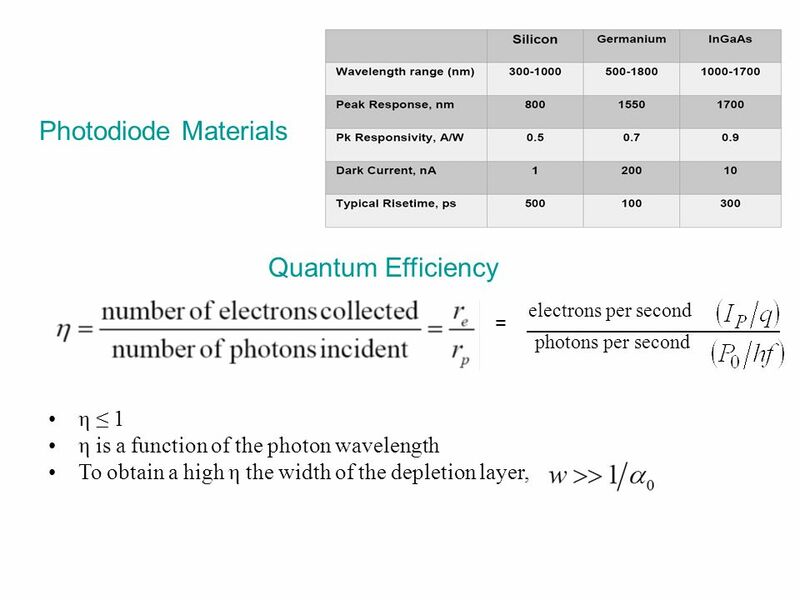 50 Quantum Noise The detection of light by a photodiode is a discrete process - an electron-hole pair is generated from the absorption of a photon. 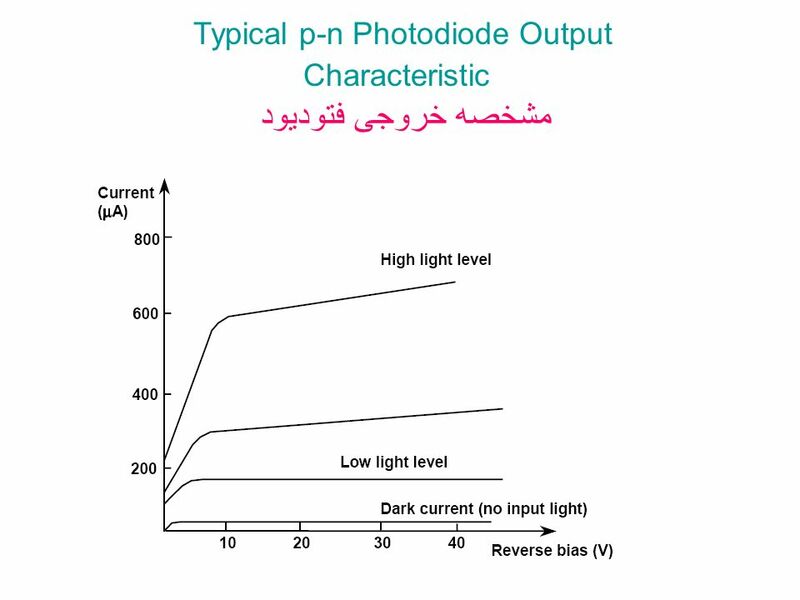 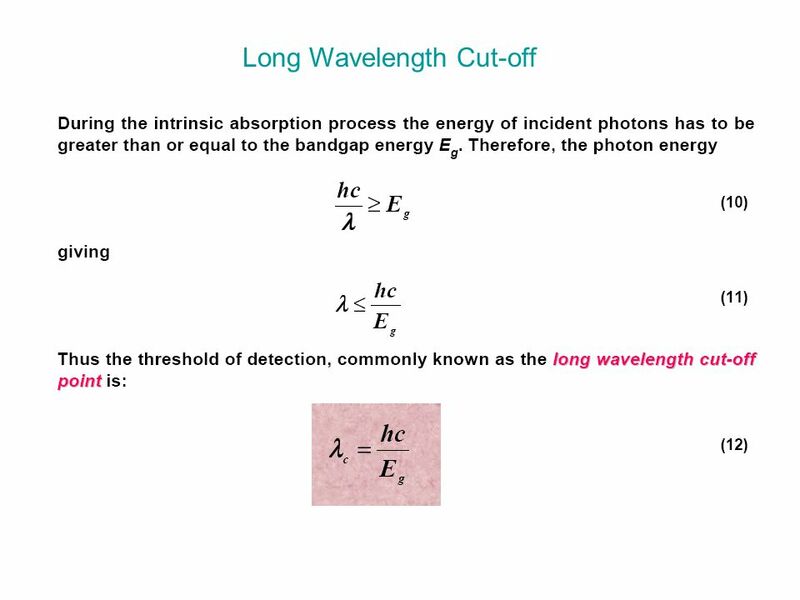 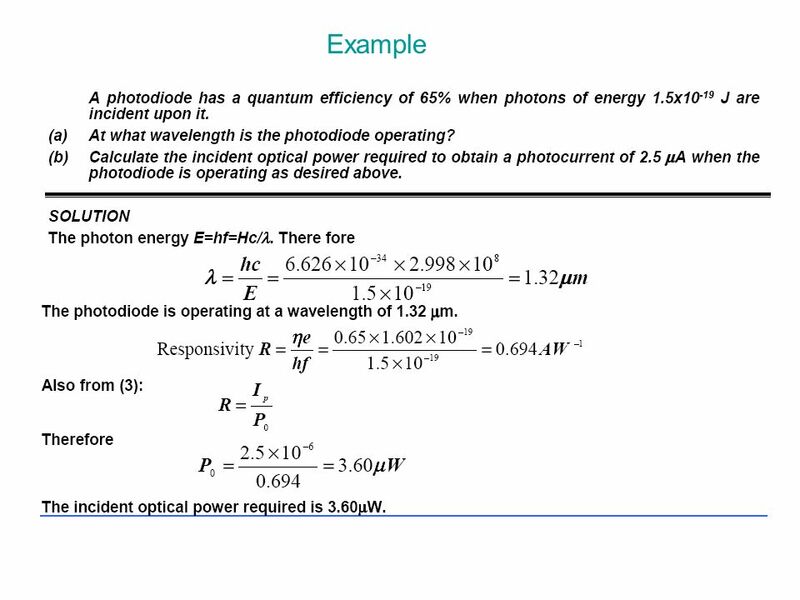 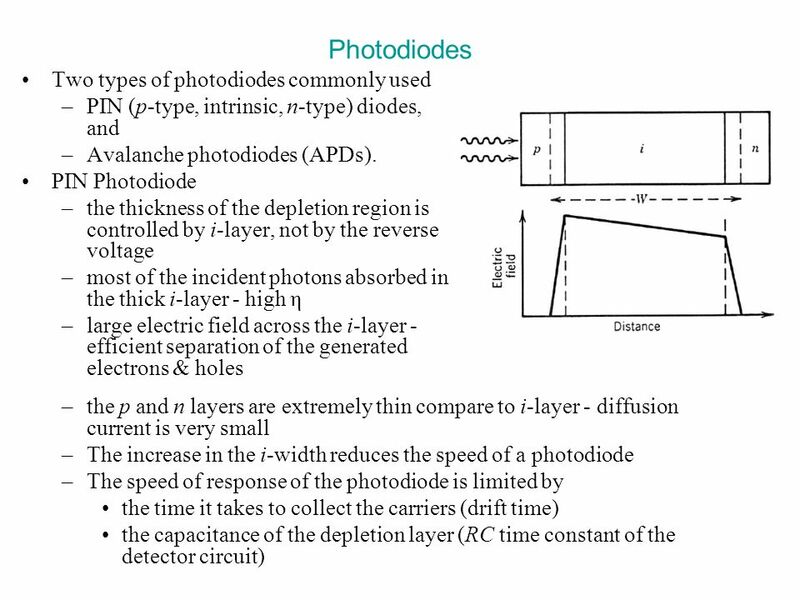 The photocurrent generated is dictated by the statistics of photon arrivals. 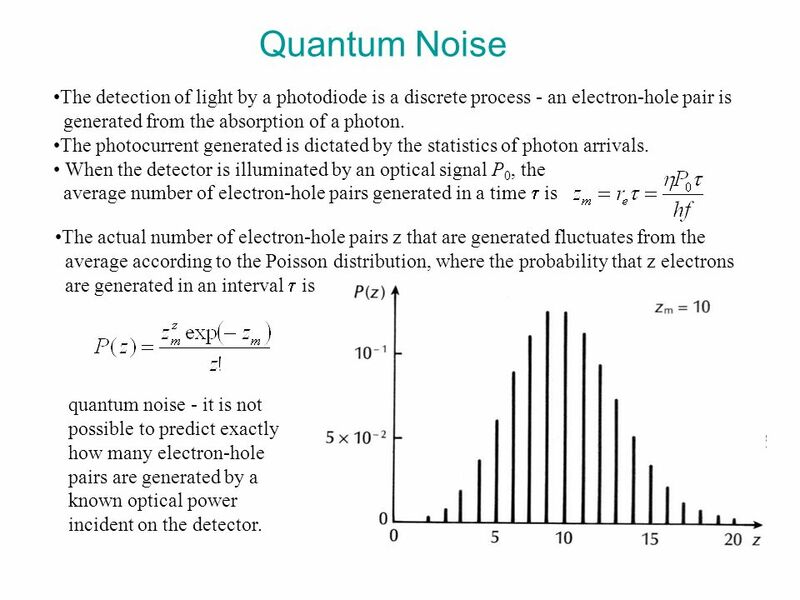 When the detector is illuminated by an optical signal P0, the average number of electron-hole pairs generated in a time  is The actual number of electron-hole pairs z that are generated fluctuates from the average according to the Poisson distribution, where the probability that z electrons are generated in an interval  is quantum noise - it is not possible to predict exactly how many electron-hole pairs are generated by a known optical power incident on the detector. 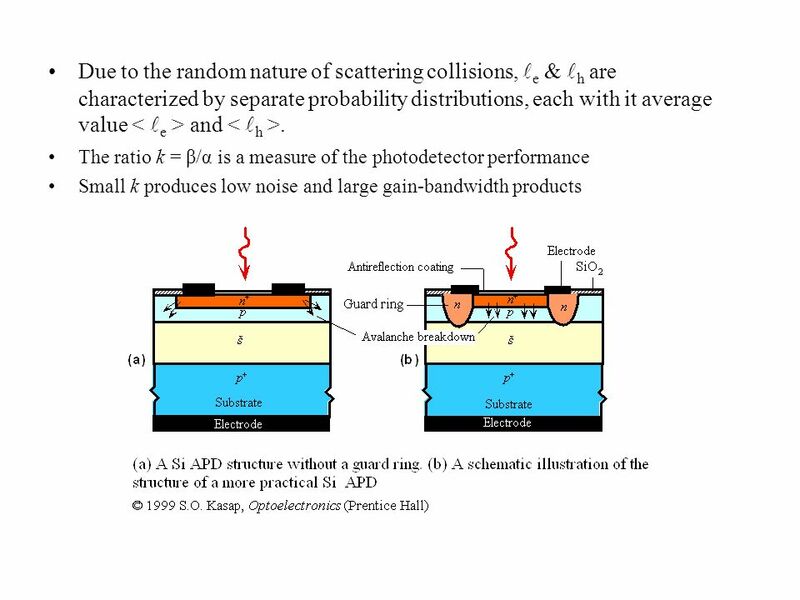 For an ideal receiver (Idark= 0, =1 and able to detect an individual photon), the probability of no electron-hole pairs (z = 0) being generated when an optical pulse of energy E falls on the photodetector in the time interval  is This error probability represents the bit-error-rate of digital system, [ P(0/1)=10-9, on the average, one error occurs for every billion pulses sent]. 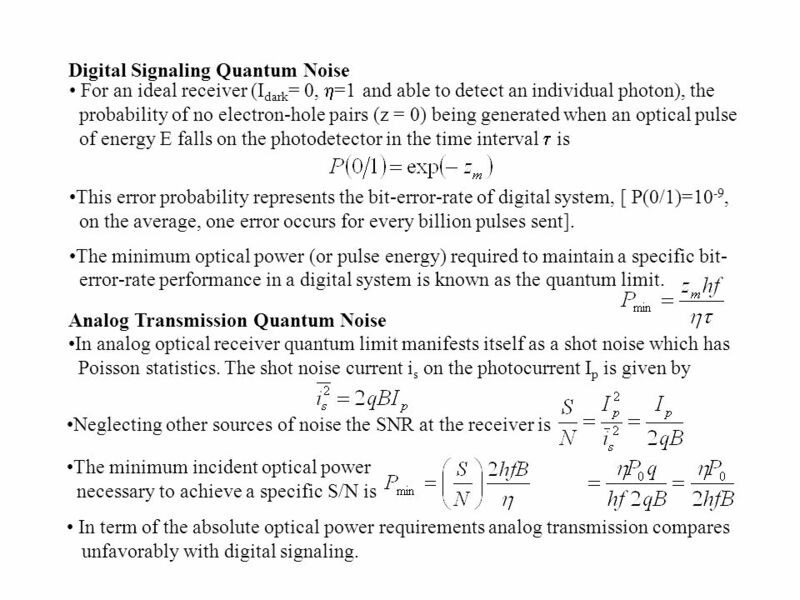 The minimum optical power (or pulse energy) required to maintain a specific bit- error-rate performance in a digital system is known as the quantum limit. 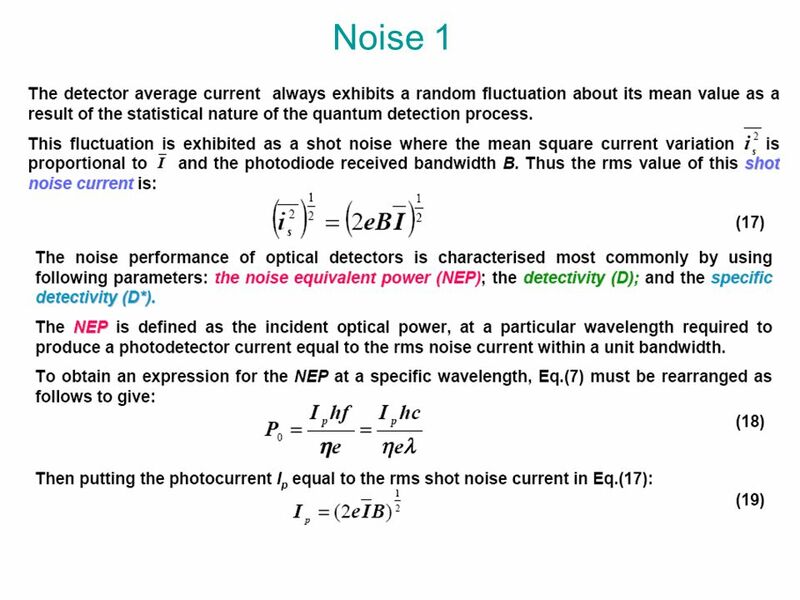 Analog Transmission Quantum Noise In analog optical receiver quantum limit manifests itself as a shot noise which has Poisson statistics. 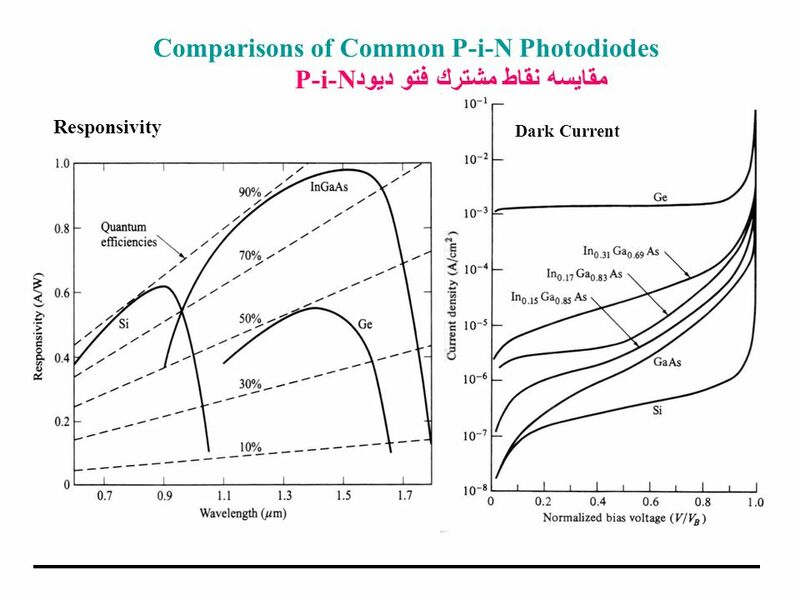 The shot noise current is on the photocurrent Ip is given by Neglecting other sources of noise the SNR at the receiver is The minimum incident optical power necessary to achieve a specific S/N is In term of the absolute optical power requirements analog transmission compares unfavorably with digital signaling. 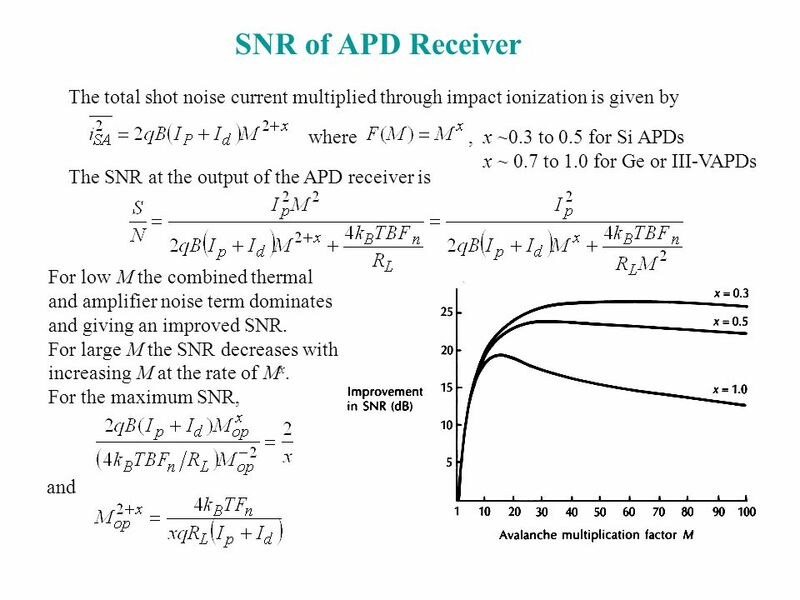 54 Receiver Noise The equivalent circuit for the front end of an optical fiber receiver, including the effective input capacitance Ca and resistance Ra. 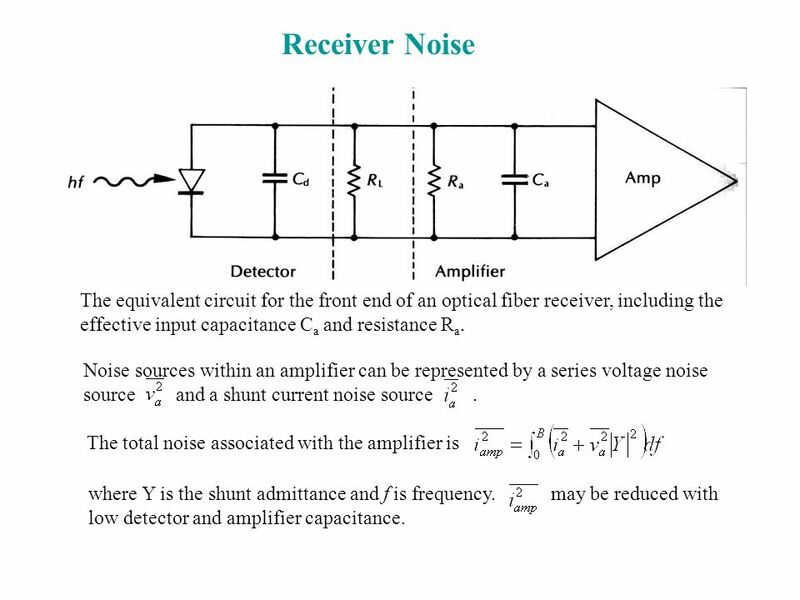 Noise sources within an amplifier can be represented by a series voltage noise source and a shunt current noise source The total noise associated with the amplifier is where Y is the shunt admittance and f is frequency may be reduced with low detector and amplifier capacitance. 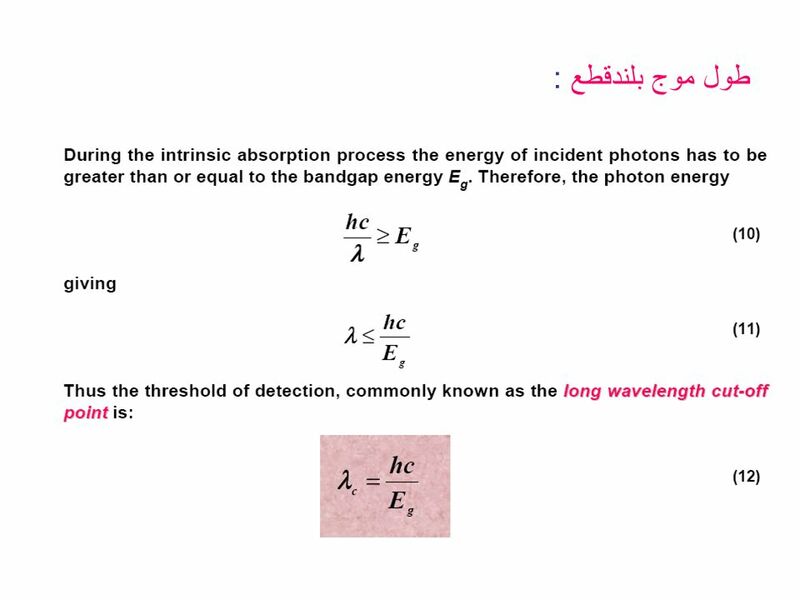 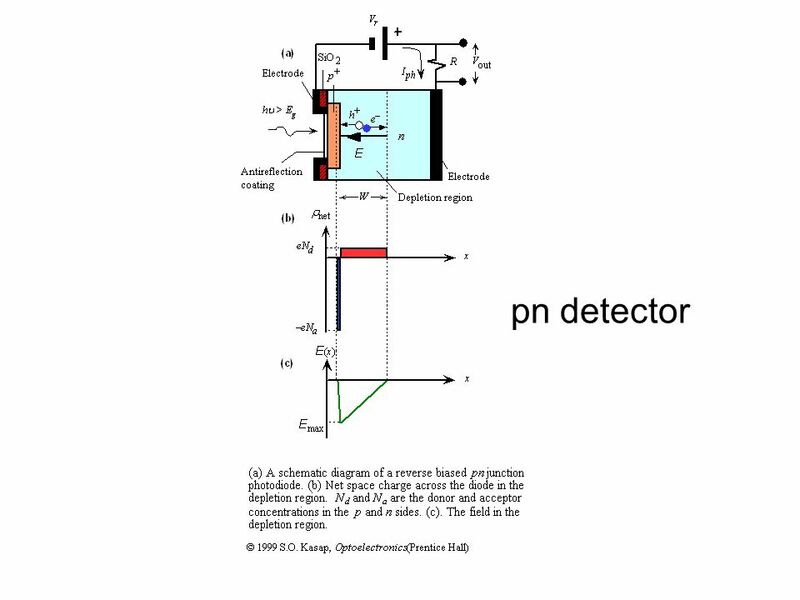 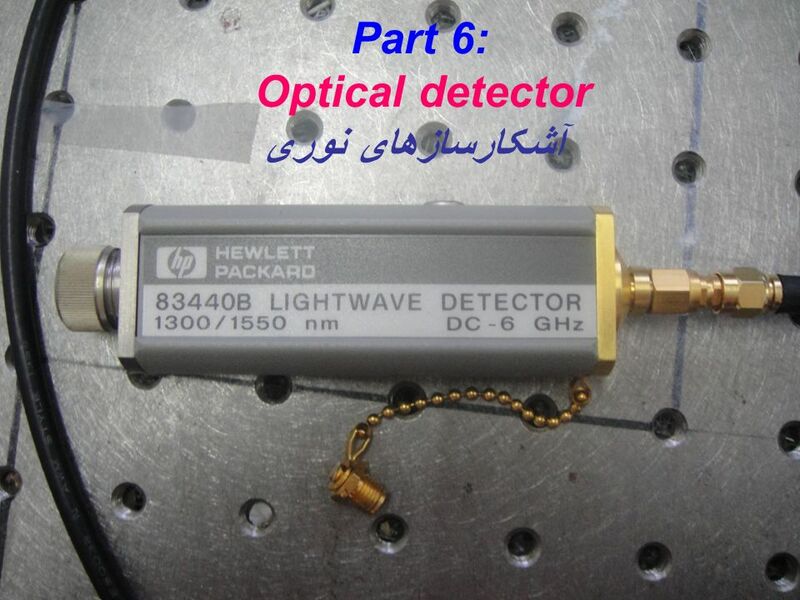 Download ppt "Part 6: Optical detector آشکارسازهای نوری"
Chem. 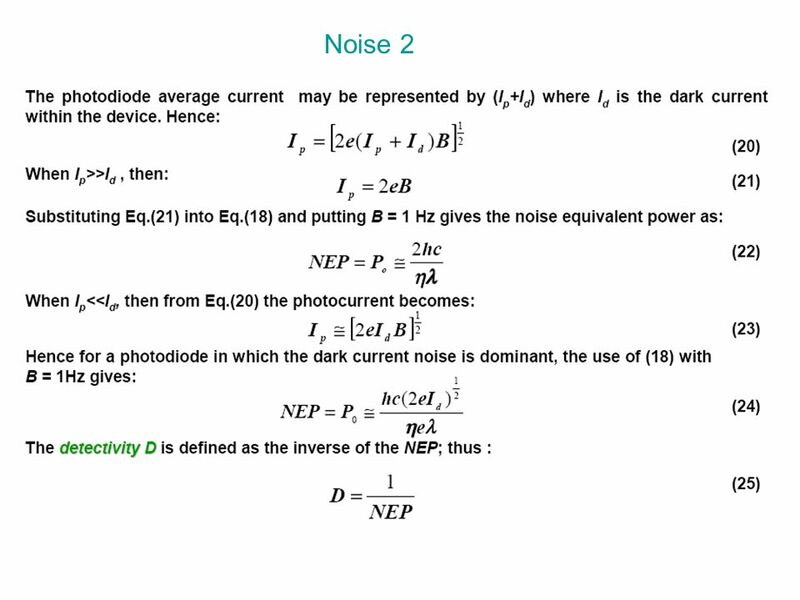 133 – 2/12 Lecture. 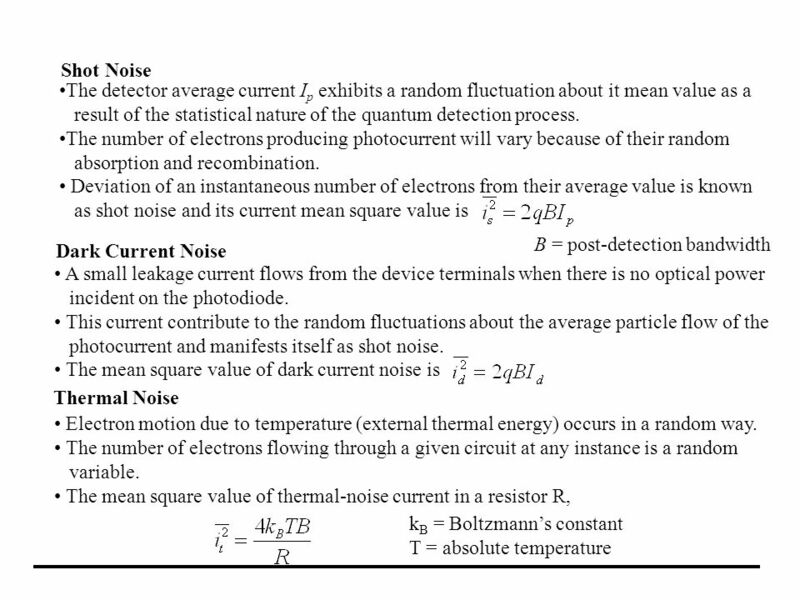 Announcements Lab Work –Supposed to Cover Set 2 Labs – but I probably won’t cover all and then will give an extra day for period. 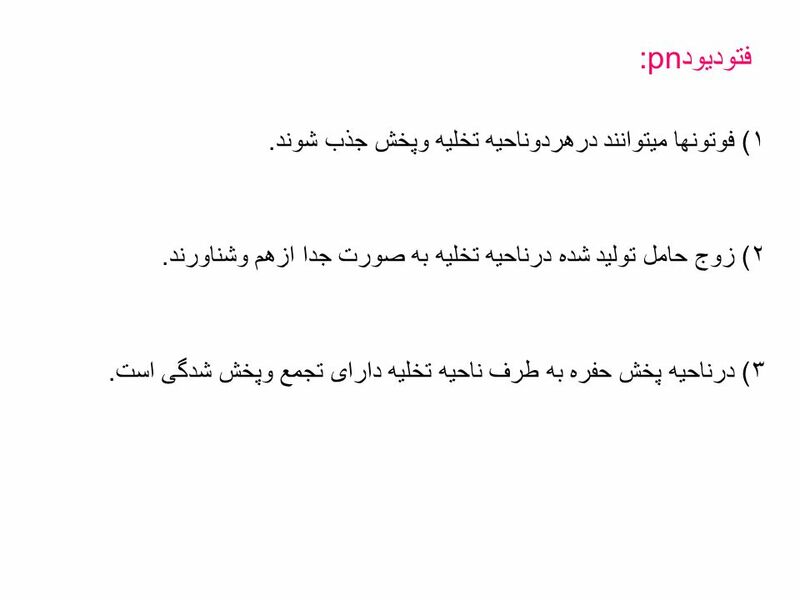 © S.N. 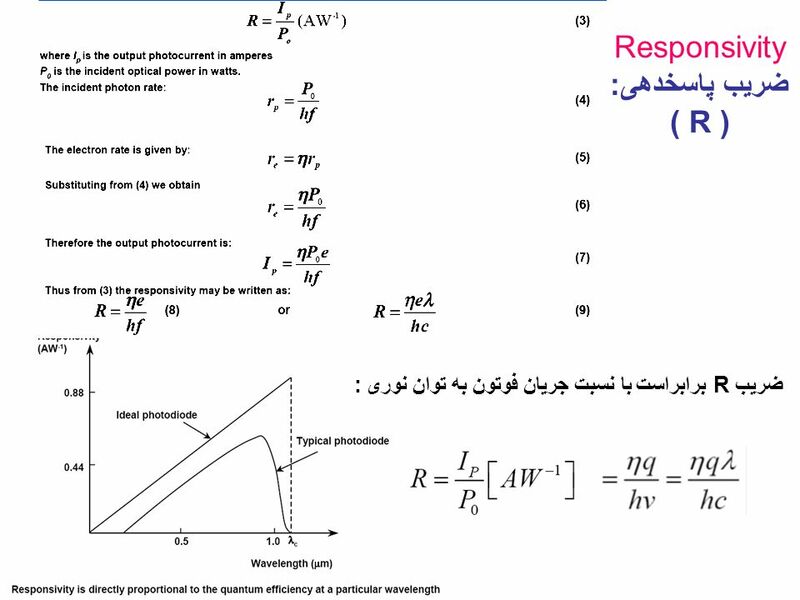 Sabki Revision CHAPTER 9 CHAPTER 9 Part II. 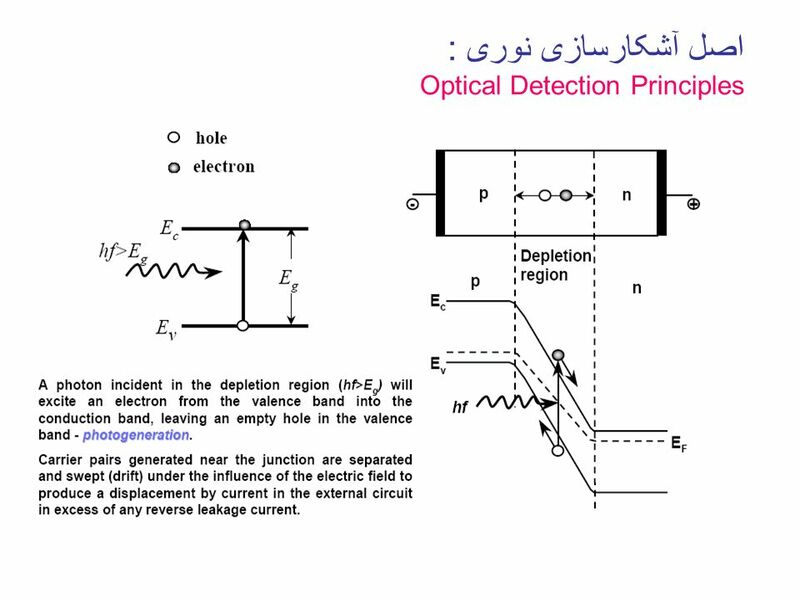 1 Fundamentals of Microelectronics  CH1 Why Microelectronics? 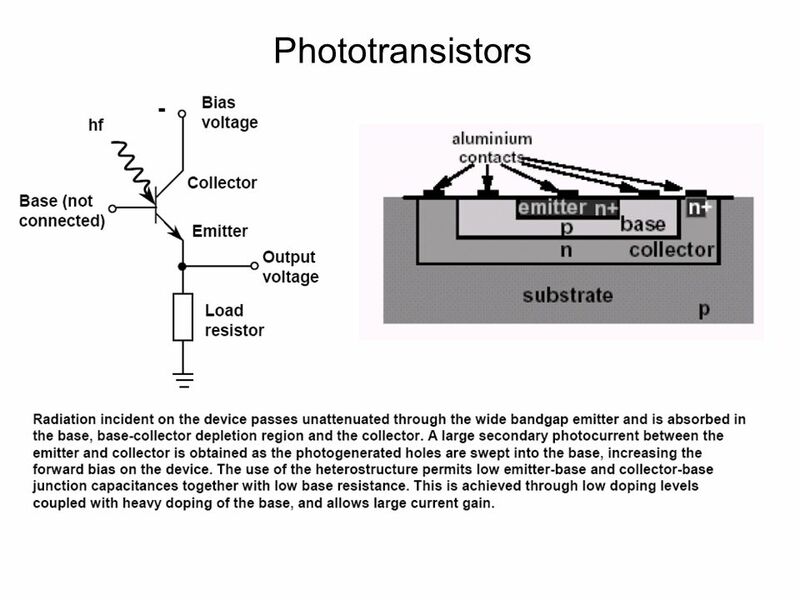  CH2 Basic Physics of Semiconductors  CH3 Diode Circuits  CH4 Physics of Bipolar Transistors. 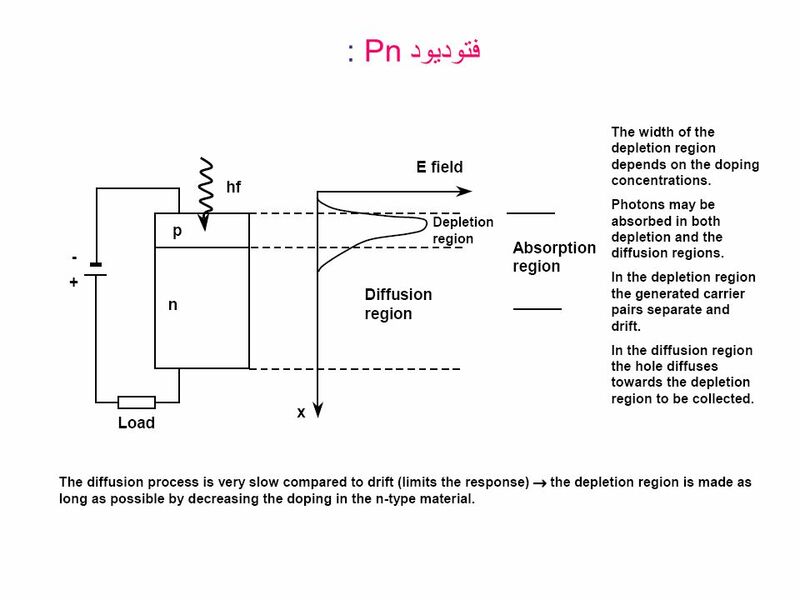 Contents : CONSTRUCTION PRINCIPLE OF OPERATION CHARACTERISTICS ADVANTAGES DISADVANTAGES APPLICATION. 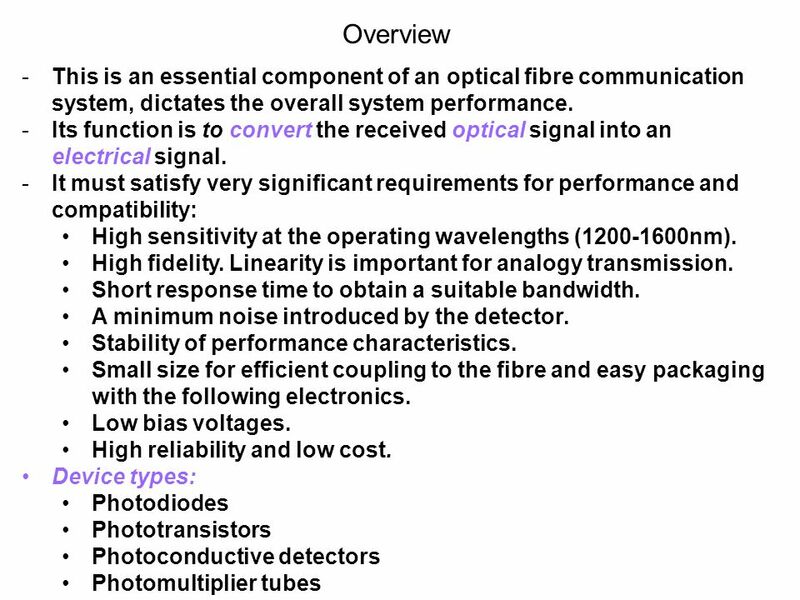 EE 230: Optical Fiber Communication Lecture 11 From the movie Warriors of the Net Detectors. 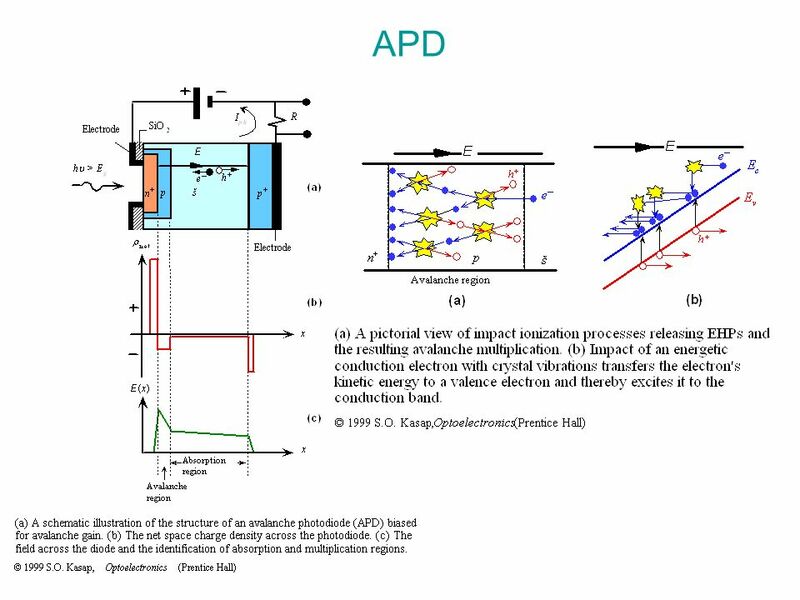 Department of Aeronautics and Astronautics NCKU Nano and MEMS Technology LAB. 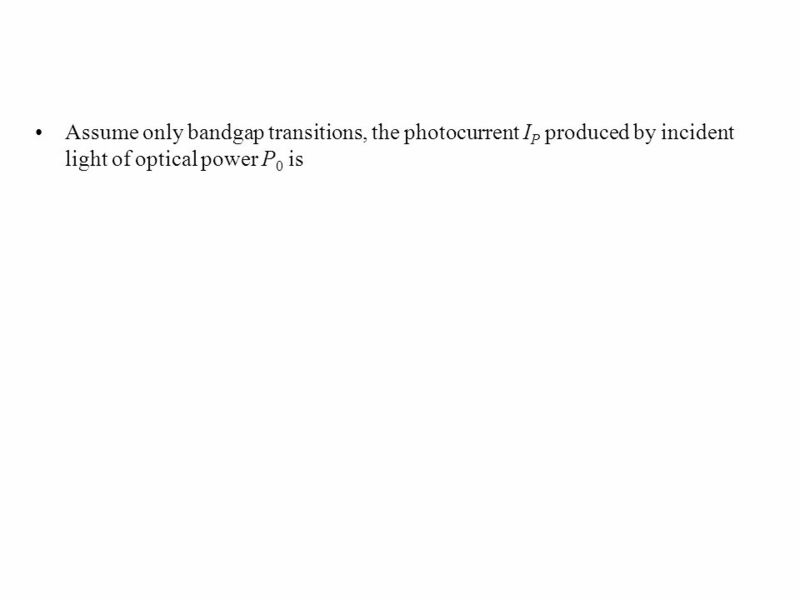 1 Chapter IV June 14, 2015June 14, 2015June 14, 2015 P-n Junction. 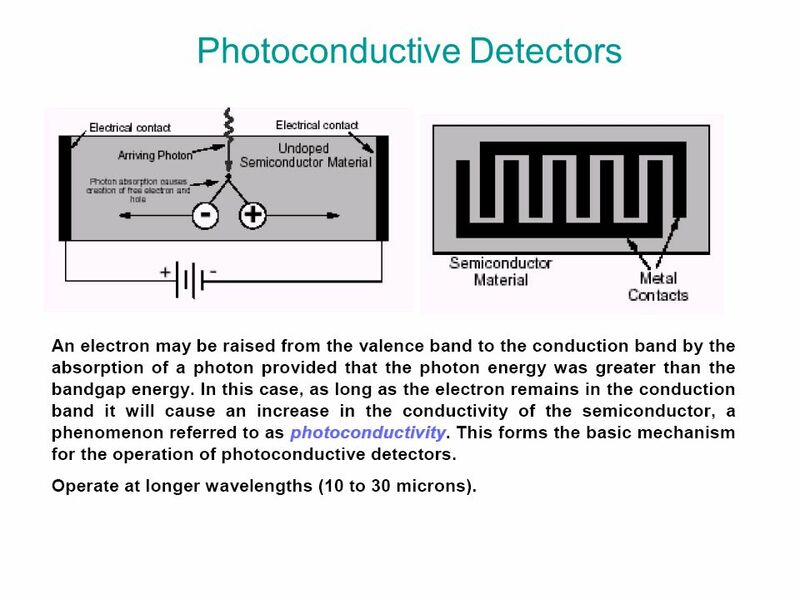 1 Chapter 5 Sensors and Detectors A detector is typically the first stage of a communication system. 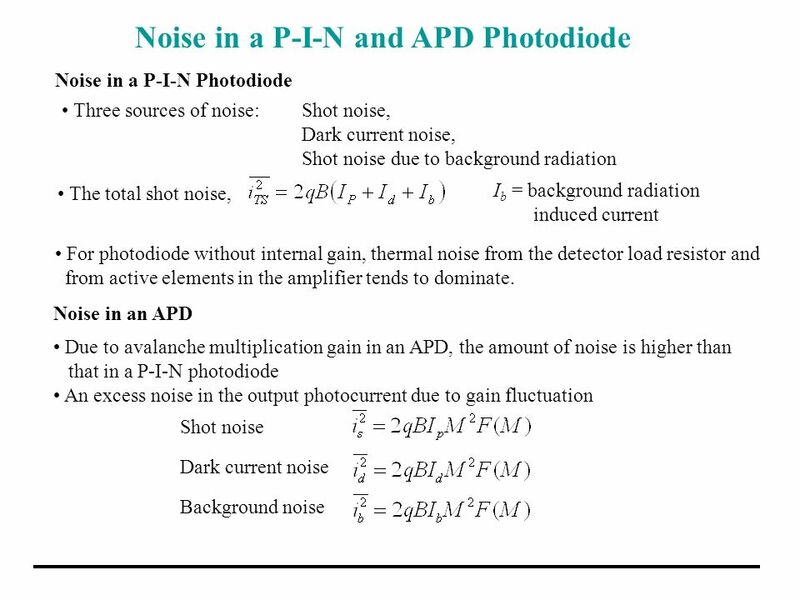 Noise in this stage may have significant effects on. 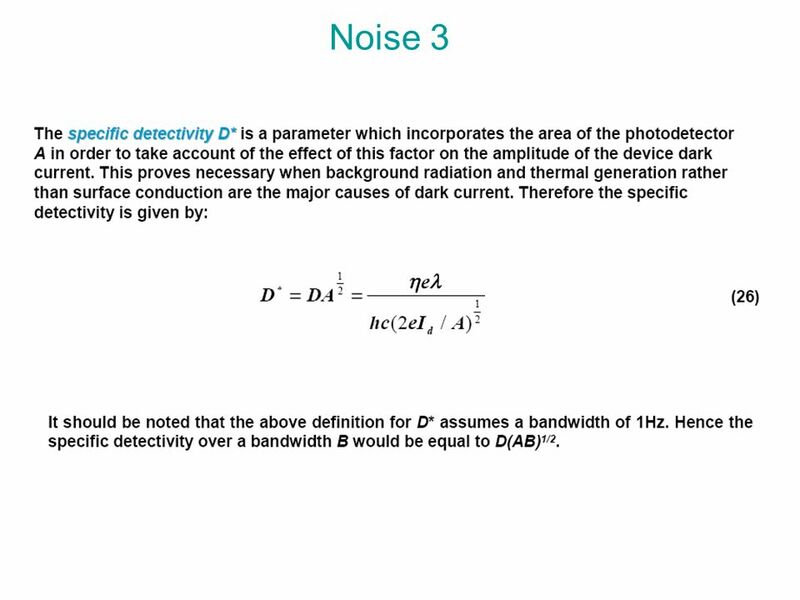 1 Detectors RIT Course Number Lecture Single Element Detectors.